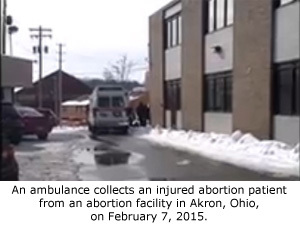 Houston, TX — Operation Rescue has documented that four women were transported by ambulance from abortion facilities across the U.S. over the weekend of February 6-7, 2015. 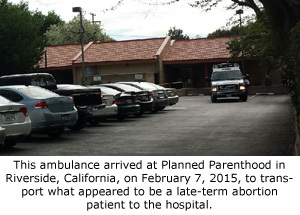 Half of the facilities where medical emergencies occurred were Planned Parenthood abortion clinics. •	Planned Parenthood, Houston, Texas, February 6, 2015. •	Planned Parenthood, Riverside, California, February 7, 2015. •	Little Rock Family Planning Services, Little Rock, Arkansas, February 7, 2015. •	Akron Women’s Medical Group, Akron, Ohio, February 7, 2015. Operation Rescue has documented at least five other medical emergencies at this Houston Planned Parenthood facility, including one involving a confusing 911 call placed on behalf of a 33-year old woman suffering massive hemorrhage in March 2014.